Spring is just around the corner and some of the smallest and loveliest flowers herald the rebirth of the season. Viola bicolor is one of my favorites. As the snow melts, we're drawn to the outdoors and it is always a joy to see what new treasure awakens with the spring sunshine. Here in western Kentucky, we still have green here and there since weeds tend to grow all winter in this climate. My flowerbeds have a thick layer of henbit and dead nettle and which even blooms through the coldest weather as long as we have a few days of sunshine. I don't count those as spring flowers, it is the little Viola bicolor that lets me know that the season is ready to change. The tiny purple flowers with their little whisker-painted faces are one of the first signs that Old Man Winter is on the run. 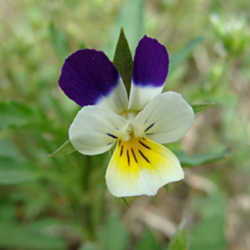 Often called Johnny Jump Ups for their resemblance to a European relative,(Viola tricolor), this tiny little annual pops up and often forms large colonies in sunny areas. It adapts well to most soil types and favors disturbed ground, or lawns (in my case) where they create a lovely show each spring. I have a yard, not a lawn and welcome all of the diverse little plants and flowers so many people despise. Instead of a blank carpet of turf grass, I have many wildflowers, which in turn, attracts early spring honeybees and butterflies. Without these sources of early spring nectar, our already suffering bee population would be in even further danger. Bees don't actually hibernate, but they go into a sluggish torpor that disappears when the sun shines and the temperatures warm a bit. It isn't uncommon to see bees hunting for a blossom or two in any given month here, so they need every spring flower they can find. This little spring wildflower, often called the field pansy is native to most of the U.S and Canada, the exception being the west coast. It was well-known by the Native Peoples and was important in their herbal pharmacy. 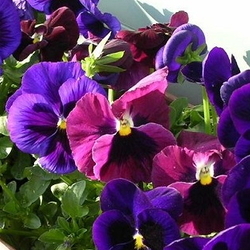 Violas were important to them because the flowers contain quite a bit of Vitamin C and the leaves have significant amounts of Vitamin A as well. They ate the leaves cooked in stews and soups because they are a source of mucilage, which thickens liquids. Native peoples used teas and decotations of viola leaves and flowers to treat headaches, colds, boils, sore throats and toothaches. They also soaked their corn seed before planting in a tea made from the roots as an insect repellent. They welcomed the appearance of these tiny flowers each year because that meant that the hard, winter season was about over and spring was once again here. These are tiny little plants, most never reaching more than six inches tall and often much smaller. Most of the time, they have light purple blooms, however white ones are not unheard of either. They all have yellow throats and darker veins along the five petals. Viola bicolor is only one of about 300 native violas here in North America. They prefer sunny meadows with ample moisture, however they also thrive in wooded areas where the spring foliage of deciduous trees has not emerged. 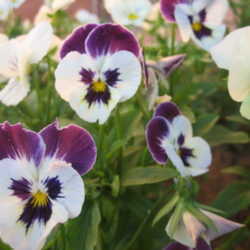 The showy little flowers produce several seeds, however like most violas, there are also cleistogamous flowers. These are self-fertile flowers that never open, but produce and set seed without the aid of a pollinator. Like most violas, the field pansy is a cool-season bloomer and seldom blooms past May here in western Kentucky. The little bicolor is seldom offered commercially, so transplanting some from a friend's garden in early spring should assure you of a colony come the next year. Once you have them established, they should reseed for many years. Just give them a sunny spot without tall plants to compete with these tiny treasures. Also remember these are annuals and the plants die and disappear after they have completed their blooming cycle, so they need to be mixed in with other plants. I let them grow freely in my yard. The grass is kept short, so the violas and the other tiny spring flowers show to their best advantage and the bees easily find them too. Don't overlook these diminutive spring offerings. Most of the earliest flowers of the season are easy to miss. Pay attention to the areas that you may not have tended as carefully during the previous season. Often, some of the sweetest surprises appear in forgotten spaces. The cheerful flowers of the Viola bicolor are among this group and when the sun shines for a week or two in late winter, they start to pop up. They don't have the crowd-pleasing and show-stopping ability that a bed of tulips or daffodils, however they have a different purpose. They warm the gardener's heart and let them know that spring is finally happening.